Hill cottage was wonderful. Great amenities and total privacy. The setting is out of this world and as avid mountain bikers to be on the edge of the Knysna forest was the highlight. We will definitely be back. I’m visiting from the states and wanted to experience everything South Africa had to offer including a wine tasting. Packwood went above and beyond my expectations. I’ve never favoured wine but still decided to give it a go and I’m glad I did. Although their selection was small they covered everything you needed to know about the different shades and history of Packwood itself. The owner, Vicky, was very personable and seemed to have everything in order despite our short notice. The scenery, customer service, and local/ homemade cheeses and wine made it a memorable day. A drive in from the N2, but worth it. Quaint little place, but enjoyed the tasting room and buying some delicious wines after a tasting of course. We did not have pairing available as there was a function in the main tent. You can book at this venue and then eat the locally produced goods and food from the farm itself. It really looked lovely. Nice to do some wine tasting & relax with the valley views on route between Plett & Knysna. A very warm and friendly welcome at Packwood Country Estate. Beautiful views and tranquil setting followed by one of the best wine tastings I’ve had. Amazing SavBlanc wines and the Pinot Noir was superb. Highly recommend a visit to the estate. Drockbo – Cape Town – One of the best Pinot Noirs in the Country!! 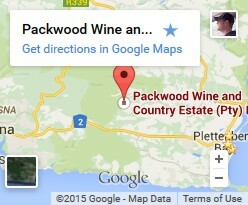 We had a really nice visit to Packwood Wines!! The owner and winemaker was so friendly and knowledgeable, and she made us feel very welcome and appreciated! They have three adorable dogs who were very sweet and loveable. It’s also a dairy farm, and they have a cute little venue called the Lunch Box where they serve cheese platters. Their wines were delicious, especially the Pinot Noir!! The nose on the wine was in and of itself put bliss, and the flavour easily puts it into a category of its own. Certainly top two in South Africa from my point of view!!! Went with my wife and two children just before new year. Plett was very busy but our guest house booked this for us. We were greeted by 3 very friendly and well behaved dogs much to my daughters delight! (Two of them spent their time with us;. not looking for food, just a fuss). The wine tasting was interesting, they are a small producer with limited, but delicious wines. The lunch was the star. Two loaves of freshly baked bread, excellent salad and chutneys, some of their own cheeses made from their own cows milk, oh…. and a glass of wine. The setting was beautiful with extensive views. We were even joined by one of the owners who was from England, everything was very relaxed and I would highly recommend it as a lovely way to spent 2/3 hours. We will definitely go back if we return to SA. What a find! We had the most delicious prebooked cheese lunch and winetasting at Packwood. We shared a cheeseboard with a selection of tantalising cheeses served with home-made ciabatta and green salad, and sipped on the good home wines. We sat in an intimate, casual porch with stunning views across the farm and valley. Wonderful peace away from the maddening crowd in season at Plett. We attended a tasting at this hidden gem and unfortunately didn’t make use of the accommodation. We had been driving around for a while looking for a place where we could taste wine and we found Packwood by chance but I’m glad we did: the tasting was great, it was good to chat with the winemaker in such scenic settings and we really enjoyed the afternoon. Packwood have their own cellar which seems to be unusual for that region. Glad we found it. Pre booked cheese lunch for a large party of family and friends, turned into an amazing experience at this `off the beaten track` wine and cheese farm. The owners and staff went out of their way in serving top rated and quality wines, great cheeses and salads, at a venue with amazing views of the forest farms and mountains around Plettenberg bay. Make the effort when in the area – you will be pleasantly surprised! We spent a wonderful Christmas week here with family. The main house is beautiful and so spacious. Comfy beds and en suite bathrooms. The pool and deck have a gorgeous view across the valley. We enjoyed the mountain biking and hiking. We loved that it was close to Plett beaches and attractions but feels like it’s in the middle of nowhere, a private retreat. The kitchen is very well equipped for self catering. The fridge is kept stocked with packwood wines too!